This turtle shaped purse is bright and distinctive with turquoise ruffles and trim around a hot pink large dotted fabric. The legs are tiny pink and white dots with turquoise cording. It is a fashion statement and a working purse with sturdy shoulder strap and plastic zipper. 12 in long. Little ones love defining what it is that makes them so special, and so do we. This fun activity book encourages kids to explore their own imaginations and preferences—treehouse or fort? Pirate or ninja? Filled with whimsical illustrations, playful prompts, and awesome stickers, This...or That? gives kids the power of creative decision making. Launch date: June 2012. MICROBES ATTACK! by DADDY-O PRODUCTIONS, INC.
Other products from DADDY-O PRODUCTIONS, INC.
A great new brainteaser with 100+ different puzzles, from the inventor of "Kanoodle" (TM) Fun microbe shaped pieces come stored in a cool petri dish carrying case. Launch date: 2012. 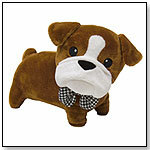 11" Roxie's Friend Wills - Medium by AURORA WORLD INC.
11" ROXIE'S FRIEND WILLS - MEDIUM features embroidered eyes, super soft plush fabric, and a bow... Meet Wills, Roxie's Friend she met in London.! He shares her exciting lifestyle and loves to travel and have fun adventures. Animal Den Play Ball by HABA USA/HABERMAASS CORP.
It’s time to catch some Butterflies. These beautiful creatures are spreading their stunning wings and flitting from flower to flower. 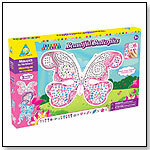 Follow a simple legend and add sparkling jewels and foam tiles to decorate these special oversized mosaics. Hang these magical Butterflies on your walls for some whimsical décor. Launch date: October 2012. 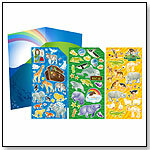 Children will have arkloads of fun with our 3-sheet Noah's Ark sticker set. Over 75 cheerful creatures of God happily await the help of little hands to find them a home on the included fold-out scene. One-time use. Fold-out scene 7" x 7". Sticker sheets 3½"x 7 ". Launch date: September 2012.